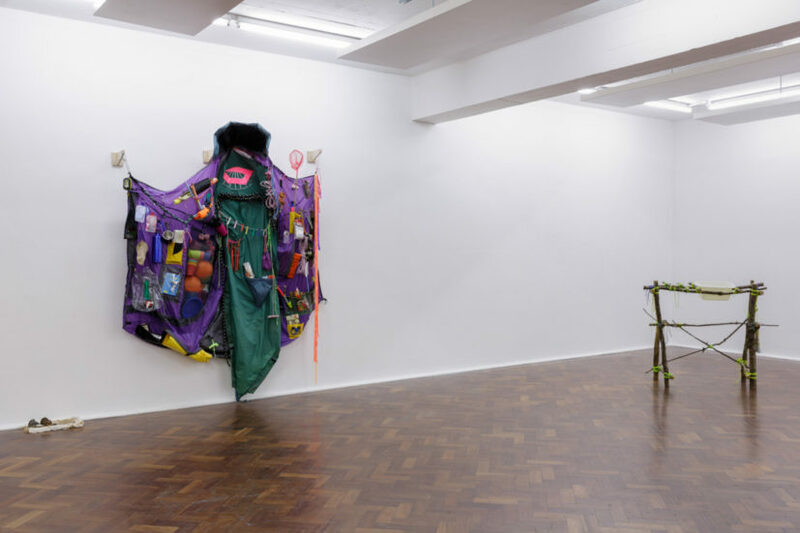 Anorak is Anna Chrystal Stephens’ first solo show. For the last ten years she has been part of a collective that goes by the name Vulpes Vulpes – the Latin term for the red fox. As a Londoner, I see foxes in my garden, in my neighbourhood on a regular basis. A million miles from the tally-ho images of rural hunts, to me they signify bold, resourceful survivors. Wild animals with the smarts to negotiate the inner city. Vulpes Vulpes have previously exhibited and hosted workshops at places as various as the V&A in London and Airspace Gallery in Stoke on Trent. Survival could be said to be Stephens’ subject. Not in a post-apocalyptic survivalist sense, nor that of conspiracy-theorist preppers. As a younger person living in the city, her concerns weave together anxieties about environmental degradation, the rise of homelessness, the exclusion of increasing sections of society from the housing market, and our conflicted relationship to nature. 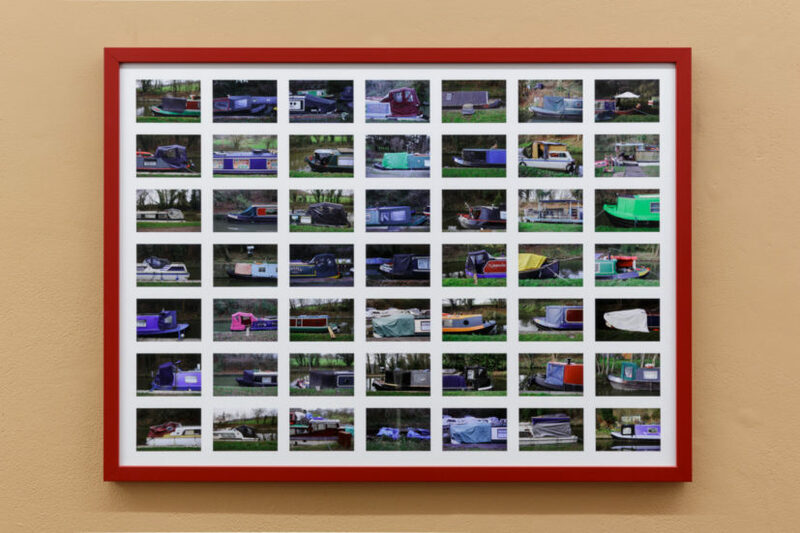 Having spent years living communally, sometimes in squats, more recently Stephens has chosen to live with her partner on a canal boat. 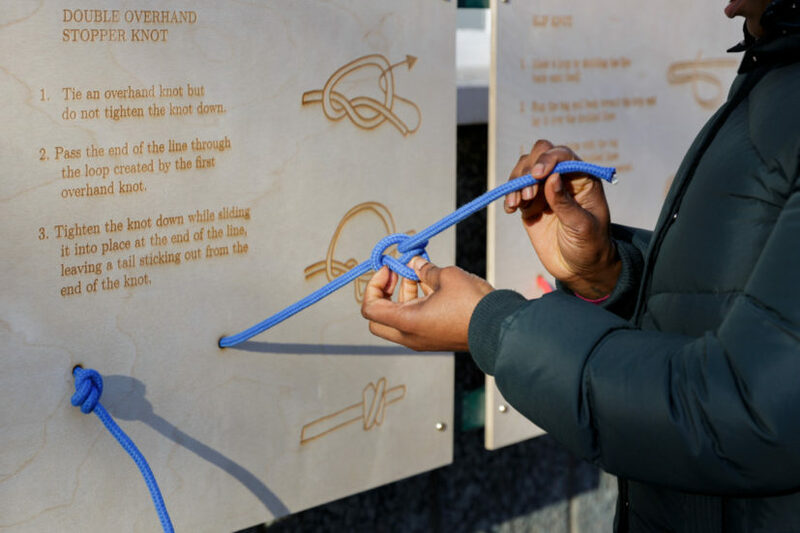 An affordable and pragmatic solution to staying in London, life on the waterways combines the craft skills of the sailor, with the practical strategies of the woodsman. 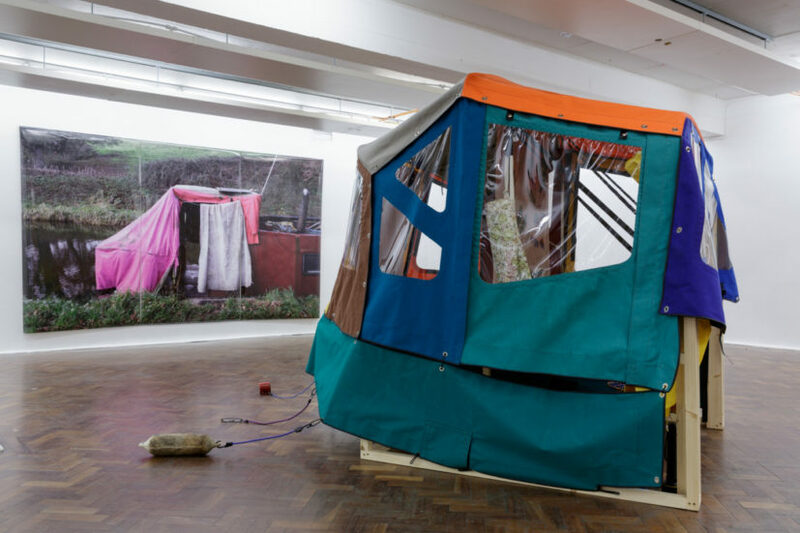 Stephens says that her current exhibition explores the ‘tension between survival, leisure and necessity and the viability of nomadic living in contemporary times.’ She highlights the gulf that exists, socially, economically, between rough-sleeping and camping, low-cost housing and leisure-cruising. 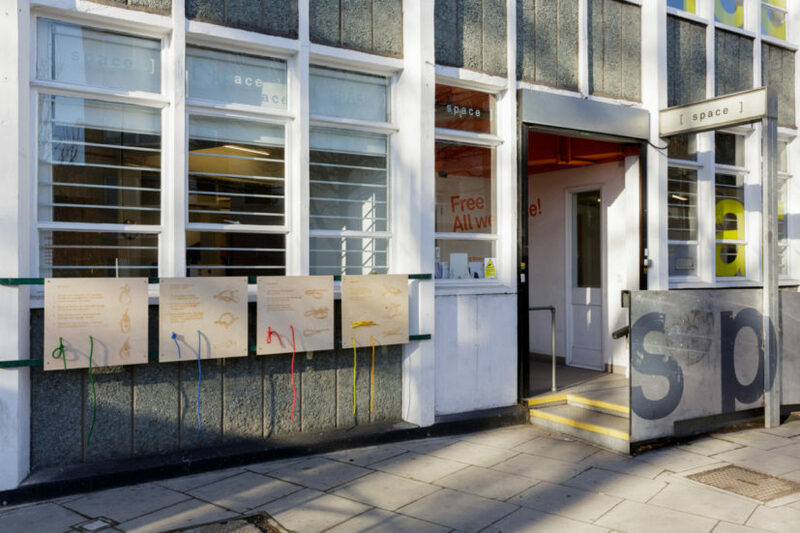 Her project is inflected with ‘anarchist ideas of alternative social and political possibilities’. At the centre of her exhibition at Space is a specially constructed stern-hood, which is destined for her canal boat after the exhibition. It is a structure designed to keep the rain out and to extend very modest living quarters. 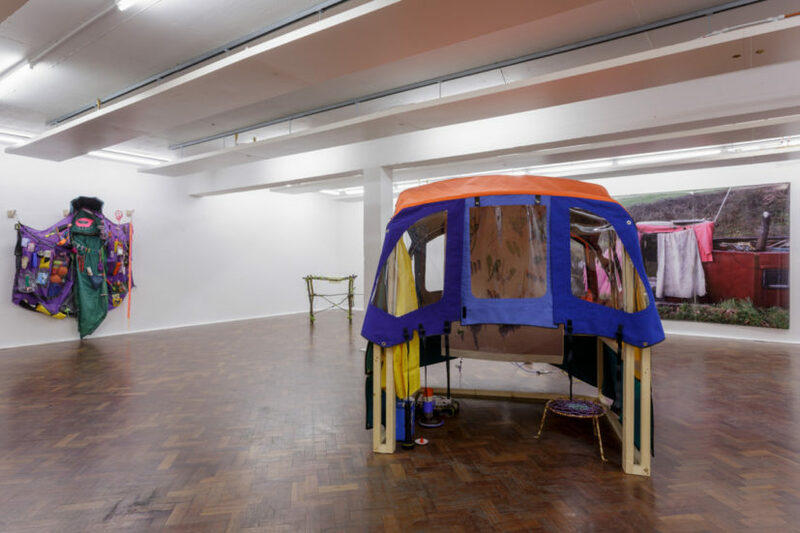 Professionally built, it contrasts dramatically with the large-scale photograph of an altogether more improvised arrangement of pink tarpaulins. Inside, the stern-hood sculpture has a charming domesticity to it. Cups and tea towels are neatly stacked, there is a stool that looks like it’s made out of a dream-catcher. One is touched by the evidence of the impulse to create home from the most modest of elements, in the most reduced of spaces. Hanging inside the structure is a textile, printed with the images of seasonal, edible plants, a version of one of Stephens’ plant boards. 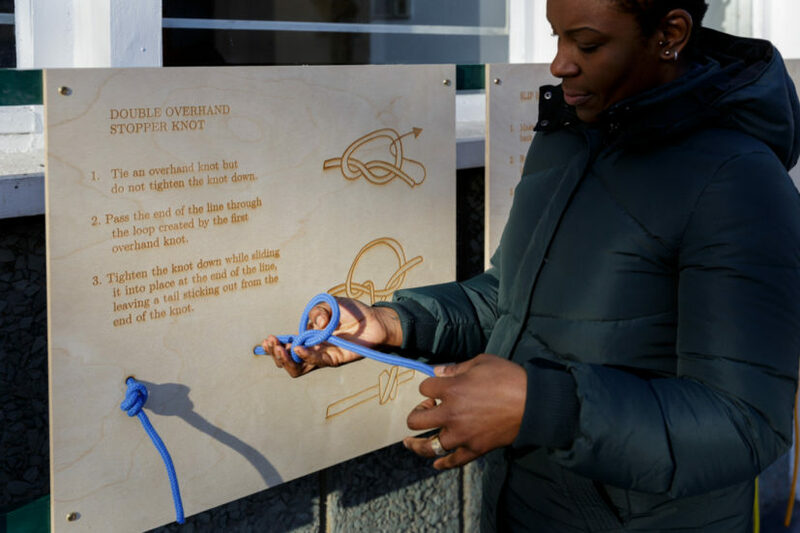 These are designed to share knowledge about the natural world and signpost an important element of Stephens’ and the wider Vulpes Vulpes project. 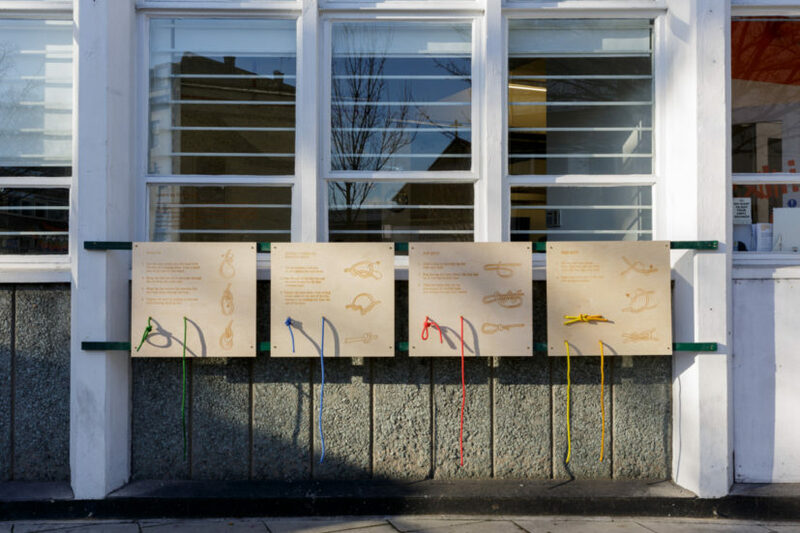 Outside the gallery, on Mare Street, are a series of boards with dangling cords, where passers-by can teach themselves to tie knots (Reef, Bowline, Double Overhand Stopper, Slip), against the day when things need to be physically lashed down. Given that, at the moment, nothing in our lives escapes the doom-laden Brexit narrative, this all takes on sharper meaning. An essay by Annebella Pollen commissioned to accompany the exhibition references various English precedents for the nomadic or outdoor life: from 1990s New Age travellers, through the hippy craft revival of the 1970s, satirised by Mike Leigh’s play Nuts in May, and back to the woodcraft movement of the interwar years. Nowadays a whole industry exists to supply high-tech, ultra low-weight solutions to every necessity of outdoor living, but the implicit romanticism of that mode of life remains the same. 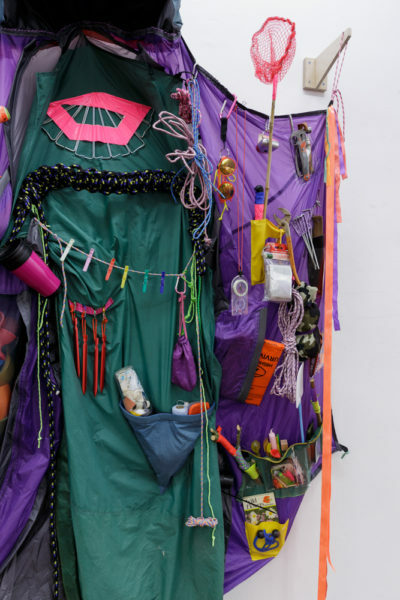 The Utility Cloak that hangs against the wall at the entrance to the gallery is an outlandish garment – a theatrically laden concatenation of tent and poacher’s coat. There are plastic cups and bowls, a foil blanket, a torch, maps, bundles of neatly coiled cord and water purification tablets, candles, compass, tent pegs, a fly swat and some chocolate. It questions our assumptions about what constitutes necessity, and how we assign value to housing. The lovely washing stand, made of slender branches strapped together with fluorescent yellow cords is too aesthetic be a response to an emergency situation – but the collection of Mesolithic reference tools (flint, iron, bone needle, the healing stone chalcedony, nettle cord, flax fibre, Horse Hoof fungus etc) laid out on a little cloth on the floor are evidence of Stephens’ long interest in prehistoric archaeology. 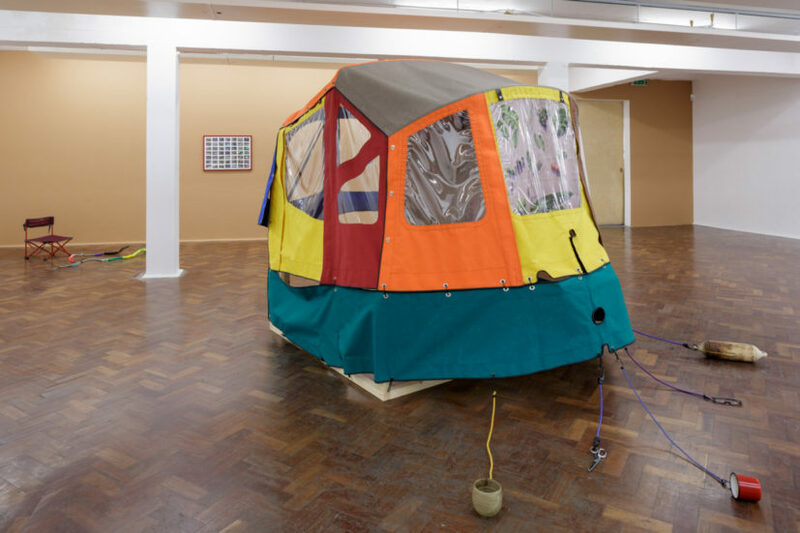 Anorak brings together a very contemporary set of concerns and explores them through the lens of Stephens’ lived experience with subtlety and self-awareness. The very idea of home is an emotive one, as is the issue of housing – the two are obviously quite separate things. The artist addresses both here with feeling, but without sentimentality, as an urgent, lived reality but without polemic.